Don’t let the colour put you off; looks can be deceiving because these pancakes are delicious! They are also the perfect post workout second breakfast, providing all you need to recover after a tough session. Add a scoop of protein powder for extra gains! – Put everything (apart from the coconut oil) into a blender and blitz until well mixed/similar to that of a thick pancake consistency. – In your best, non-stick frying pan, heat the coconut oil on a medium-high heat. Using a ladle, or something similar, pour a spoonful into the pan and cook like normal pancakes. Flip halfway through as they begin to darken. Once cooked, start the next one and so on until the mixture is all gone! 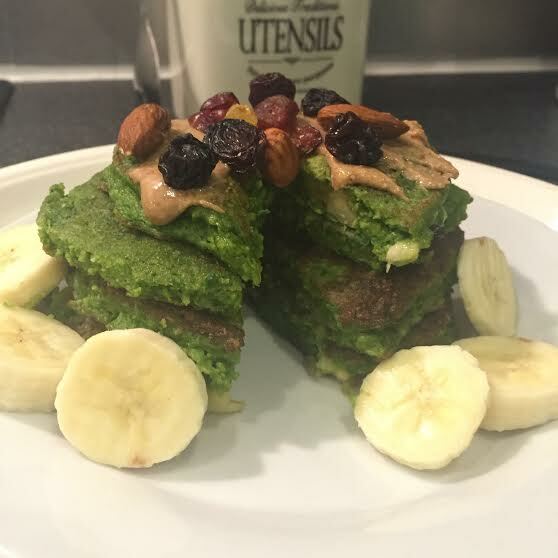 That’s it, post workout green pancakes, it’s as simple as that! Top with whatever you fancy – my favourite is another banana and some Meridian’s smooth peanut butter – delicious!